"Be a disciple, and make disciples. Care like Jesus." This is the vision of Care Assembly of God. The Mustard Seed singing group have decided to live for God and answer His call to sing for His glory. As a pastor, I want to “let my people go” and fulfil their calling in God. To encourage them to move in a “big” small step to produce the album, I decided to sponsor this CD in conjunction with CARE’s anniversary on 26 Aug 2014, to be released during our thanksgiving service. Both Sharon and Winnie were among the pioneer members of the children’s choir in Grace Assembly, where Sharon was also the pianist of the Dunamis singing group. From a young age Starz heard her mother Winnie and aunt Sharon sing and worship, and asked to be a part of the group. Following the examples of her elders, she learnt to respond to the Holy Spirit’s prompting to make joyful tunes to the Lord, and wrote the chorus of “Keep My Heart in Jesus”. Some of these songs were written for CARE’s special events. In 2007, the group wrote “Love Comes From God” for Parents’ Day. Others were inspired during worship and devotion, when the Holy Spirit put new songs in their hearts. “Let The Weak Say I Am Strong” was inspired during devotion and written for Easter. 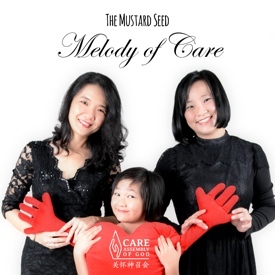 The album is named “Melody of Care”, which expresses how God led The Mustard Seed to produce melody in their lives. They speak of how real God is; in times of difficulty, He can use different songs in your hearts to produce new ones. It is my desire to share these meaningful songs with you. Though not all of it is perfect, let the perfection come from God to minister to you through the sincerity of the music. Let it be the beginning of a humble journey to reach the uttermost parts. May God bless the hearers of the CD. This little singing group has its roots at the beginning of the history of CARE. Like a mustard seed with humble beginnings, they sang for Jesus and ministered to people according to the gifts and talents God has given to each of them. The Mustard Seed comprises of 3 sisters: Sharon, Winnie and Starz. The former two have known the Lord Jesus Christ from childhood and have journeyed together in the faith for many years. In worship, they have sung many a new song unto the Lord. As He put new songs and inspired them with lyrics and melodies, they responded to the leading of the Holy Spirit and wrote them down. Starz, though a child, has always worshipped together with the adults in church, and following the example set by her mother Winnie, she too has learnt to respond to the Holy Spirit’s prompting to make joyful tunes to the Lord. The chorus of “Keep My Heart in Jesus” was written by Starz. “Love Comes From God” is the result of a collaboration by the group in 2007, to write a song to show our appreciation to the parents in our midst during our Parents’ Day celebration. This was the first song that was formalised by the group, and when it was presented, it visibly touched the hearts of those who heard it. However, it was never sung again until in June 2010, when our Senior Pastor asked for it to be the theme song of our church retreat. At that time a trio of believers from Nigeria had come to worship with CARE during their studies in Singapore. Seeing how they loved this song, we realised that every song that God had put in our hearts can be used for His glory and to minister to people. Each of these seven songs has a unique testimony of the grace of our Almighty God, who gives us a Blessed Hope of salvation. May He cause them to minister to all who hear, and let the mustard seed grow and bless you. The Mustard Seed would like to give thanks and glory to Jesus Christ for the gifts and talents that He has given them, enabling them to sing for Him. Our families, all of whom we believe will come to Christ eventually. During worship practice in church, Starz sang from her heart & knelt down to worship God in singing. On the way home, she expressed her view on what it meant to be a Christian, which surprised me. She talked on and on for a while. I suddenly asked her if she was a Christian and she replied me immediately, "No, no, no, I am not." I explained that a Christian is one who believes in and follows Jesus, and that it was a personal choice which no one can make for her. I asked her if she would like to be one and without a second thought she said yes. After praying the sinner's prayer, she spontaneously sang one of her favourite songs, "Behold, behold! I stand at the door and knock… if anyone hears my voice and will open the door, I will come in." I knew she had truly accepted Christ by her own will. She then requested to ring her loved ones so she could inform them of her decision. As time passed and we did devotion together, she asked why she could not be baptised since she is already a Christian. We realised that what she asked was biblically sound and understood that it would not be right to deny her desire to make her decision public by water baptism. In her own words, “The song that made me a Christian is "I have decided".” What's yours?" When I was in primary school, I loved singing Christian songs to worship God. I would sing anytime, anywhere and in any situation to express how I felt to God. It was at this stage in life that I became grateful to God for sending songwriters who would write songs to help me express my joy, praise, pains and even griefs to God. The songs have encouraged me deeply throughout my life. At either primary 3 or 4, I made a small secret prayer to God and told Him my desire that someday, I too can help others in the way that those songs have lifted my spirit and helped me pour my heart to God. May God use these songs to touch someone's life as He had used someone's songs to touch and impact mine. It was a period of reflection and self-discovery: I was having my sabbatical and was waiting for new direction from the Lord. As I contemplated and doubted my abilities, God graciously gave me new insight about humility. I know from Proverbs that "pride goes before destruction", and that a Christian ought to be humble. But I am beginning to learn the other side of this truth. Being too humble makes us doubt not only our own abilities, but also the power of God to use us in our weakness; that may be equally detrimental to our Christian walk. It leads to inaction; it stagnates our spiritual progress by disabling us from a deeper experience of God's will in our lives. God gives us abilities: through nature or nurture. Doubting your ability is akin to doubting God's gift to you. Therefore I will no longer think in the old way, but rather be ready to do His will, "for when I am weak, then I am strong" (2 Corinthians 12:10). I believe that God wants to add talents to us, but only after we have proven faithful in the small things. Do not despise your "small" abilities: they are gifts from God. In response to God’s word, I write this song with what gift and ability I have today. I will use it all for Jesus Christ, and leave it to Him to make it a blessing, just like the five loaves and two fish. It does not matter what others think of the work; all that matters is that the Lord is pleased with it. To God be the glory! During prayer meeting night, we prayed corporately and later each of us spent some quiet time before God to pray for ourselves. As I knelt down to pray, I kept hearing tunes, with the words 'step by step' and “I'm following, following you". This eventually became the chorus. I also heard some words repetitively. As prayer meeting ended, I quickly jotted down the words and impression of the song. A few months later, while in the car, I heard the tune of the verse while worshipping God and I hummed it. Suddenly I heard God say this and the earlier portion are from the same song. I was surprised but when I hummed the 2 portions one after another I realised I got the tune of the verse that night. I immediately set to work and wrote down the whole song. Indeed, no one knows the future but following God and having the assurance that He holds our hand gives us the strength to carry on. It all happened one rare afternoon when I could spend quality time with my daughter. I watched Starz practise at the piano and contemplated how good it was to have time to worship God together. As we experimented with the different sound effects on the keyboard, we came across the sound of a telephone ringtone. I began to sing the words, “Jesus I call You,” and asked Starz to sing along with me as we continued playing on the keyboard. On a deeper level, it reflected what I really felt in my heart. I had heeded God's call in my life, and now continue to call on Him who alone is able to help me. Most of all, He loves me, and that truth has had the most important & greatest impact in my life. Sharon had always loved singing at the piano, but always it was something that was written by someone else. In recent years, however, as she worshipped God with her voice and instrument, new songs began to flow out of her as the Holy Spirit enabled. At a time when the going seemed tough, she went before the Lord at her piano at home and began to worship, asking the Lord for strength and wisdom. It was then that these words took a new meaning in her heart, as she realised that it was only when one was truly "weak", unable in human terms to solve problems, that God's power can be made perfect through those weaknesses. This song was born out of two of her favourite hymns, Amazing Grace and Give Thanks, which have spoken to the hearts of many a soul through the years. On the morning 11 Mar 2014, after I sent my child to school, I sat down to pray and prepared to read the Word of God. As I prayed, my heart was filled with an image of the many great men and women of God I knew who have given up so much and paid a price to answer God's call in their lives, who have done so willingly because they love Jesus and know His heartbeat: for men to be saved. Often, they labour for years and sometimes it seems nobody knows or hears but they know the final approval is from the Master Himself, and as His good and faithful servants they do not seek the applause of men. They have experienced miracles and been through trials. In all this, with their grateful hearts, they just want to walk in the footsteps of the Master. This song was written in just over an hour. I respectfully dedicate this song to God's faithful servants everywhere whom we can follow, as they follow Christ wholeheartedly. One afternoon, we were enjoying our “You & Me” day having a mini steamboat at a Japanese food court. We settled down at a nice, quiet corner and tucked into our lunch. Out of the blue, the little one popped an unexpected question. "Mama, how do I know know which is the right man to marry?" She was 5, and I was taken aback but I knew it was important to give her a real and honest answer; if I did not, someone else might give her the wrong one. Children, no matter how young, are smart enough to measure the truth in our answers. A right and sincere answer will remain with them as they grow up. So I told her, "Keep your heart in Jesus when you are young and when you grow up, Jesus, who knows who is the right man for you will give your heart to him. Pray also for the right person, that he will keep his heart in Jesus, so that when you both grow up, Jesus will give your hearts to each other. In this way, you will marry the right person." At that moment, we heard some pop music in the background. Starz asked, "Are they singing about keeping our hearts in Jesus?" "No," I replied. She then asked me if anyone had written a song about keeping their hearts in Jesus. "Why don't you write one?" I suggested, and immediately she came up with the chorus of the song. Later, I wrote the verses and combined our song. 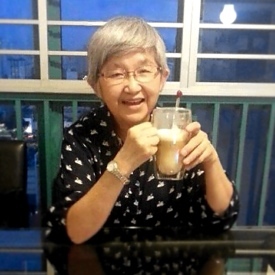 In the following month, January 2012, we dedicated this song to our pastor Rev Chng Mui Yong for her birthday to appreciate and encourage her. A valuable lesson came out of this gesture as the little one learnt that although she did not have the financial means to buy a present, she could make gifts that come from her heart. We wanted to do something different that year to show our appreciation to the parents in our midst, and decided to write a song for the occasion. Three sisters sat down to brainstorm for ideas one Saturday to share how we felt towards our parents, and decided upon a song based upon the theme that God has good plans for every family, if we would let Him be at the centre of ours. Winnie put the ideas together and came up with the lyrics and melody, Sharon made a final arrangement to the music and finally, a song was born. Winnie and Sharon had previously written songs, but have never formalised them; writing lyrics was a new experience for Esther; as such, this was quite a first for them and they did it in a relatively short time. During the first performance on Parents' Day, we saw that the song had visibly touched the hearts of friends and believers among us. However, it was never sung again until June 2010, when our Pastor asked for that to be the theme song of our church retreat. The composers had almost forgotten about the song by then, and yet, the song had once again touched the hearts of our new friends from Nigeria, and it was then that we realised that every song that God had put in our heart can be used for His glory and to encourage people.